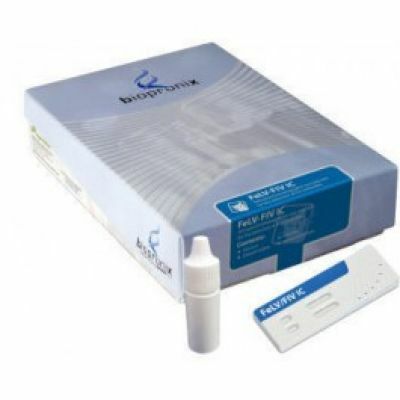 The FeLV IC test, based on the immunochromatograph technique, allows for the detection of p27 antigen of Feline Leukemia Virus in samples of whole blood, serum or plasma. An anti-p27 monoclonal antibody is conjugated with colloidal gold and another specific antibody is immobilised on the membrane. If present in the sample, the FeLV antigen will bind to the antibody conjugated with gold and form an antigen-antibody complex. This complex will then migrate forward on the membrane. The specific anti p-27 antibody immobilised on the membrane at the level of window ‘T’, will bind to the antigen- antibody complex, indicating a positive result. At the level of window ‘C’, the reagent will bind to the antibody conjugated with colloidal gold, whether the sample is positive or negative. This binding will cause a line to form in window ‘C’, indicating the correct functioning of the test. Negative Result: The test is to be considered negative if only one band appears in the window ‘C’ (internal control line). Positive Result: The test is to be considered positive if two coloured bands appear, in wondow 'T' (test line) and in window 'C' (internal control line). Controls: A control line should appear in window ‘C’ of the test to confirm the correct execution of the test. The FIV IC test is a double migration immunochromographic indirect test. A FIV recombinant antigen is bound as a capture reagent on the nitrocellulose membrane at the level of window ‘T’ of the device, while a monoclonal anti-cat IgG antibody is conjugated with colloidal gold, and absorbed at the level of window ‘S’. When the sample and the diluent are added in window ‘S’, they migrate towards window ‘T’. The sample recognises the antigen bound on the membrane, forming an anti-FIV antibody+FIV antigen complex. The conjugate reactivates forming the FIV antigen+anti-FIV antibody + conjugate complex. This complex creates a red line at the level of window ‘T’. Negative Result: The test is to be considered negative if only one band appears in window ‘C’ (internal control line). Positive Result: The test is to be considered positive if two coloured bands appear, in window ‘T’ (test line) and in window ‘C’ (internal control line).